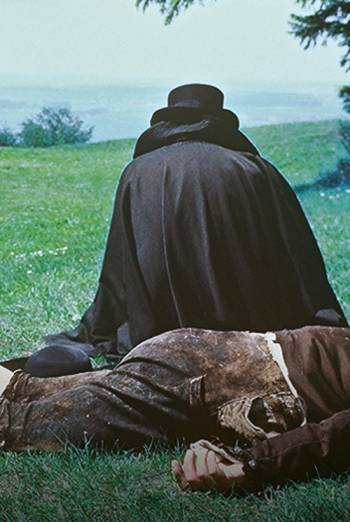 JEDER FÜR SICH UND GOTT GEGEN ALLE – THE ENIGMA OF KASPAR HAUSER is a 1974 subtitled drama based on the true story of a barely articulate young man who turns up in Nuremberg in 1828 after spending his whole life kept alone in a single room. Mild violence occurs during a scene in which a character is hit several times with a stick. However, only an impression of the impacts is given. Some bloody evidence of the beating is seen on a path; blood is also shown on the clothing of a character who is the victim of an apparent stabbing. The bloody detail has an unrealistic appearance and is not dwelt upon to an undue extent. Another scene features an autopsy, during which the corpse's brain is carried to a table where it is examined, but these images contain no gory detail.